The ear is the sense organ in vertebrates that detects sound and also plays a major role in the sense of balance and body position. The ear shows a common biology from fish to humans, with variations in structure according to order and species. The word "ear" may be used correctly to describe the whole vertebrate ear, or just the visible portion. In most animals, the visible ear is a flap of tissue that is also called the pinna. The pinna may be all that shows of the ear, but it has only a tiny role in hearing and no role at all in the sense of balance. In people, the pinna is often called the "auricle." Vertebrates have a pair of ears, placed symmetrically on opposite sides of the head. This arrangement aids in the ability to localize sound sources. The ear and the process of translating sound waves into recognizable nerve impulses by the brain is stunningly complex, involving movements of membranes, small bones, fluid, hairs, chemical neurotransmitters, and electrical impulses in neurons, as well as the utilization of various principles that act to increase sound pressure. In recent years, biomedical engineers have developed means to combat hearing loss, including cochlear implants attached to tiny computers, that convert sound into electrical impulses, then into radio waves that activate electrodes, which stimulate sensory nerves. Audition is the scientific name for the perception of sound, commonly referred to as hearing. Sound is a form of energy that moves through air, water, and other matter, in waves of pressure. Sound is the means of auditory communication, including frog calls, bird songs, and spoken language. Although the ear is the vertebrate sense organ that recognizes sound, it is the brain and central nervous system that "hears." Sound waves are perceived by the brain through the firing of nerve cells in the auditory portion of the central nervous system. The ear changes sound pressure waves from the outside world into a signal of nerve impulses sent to the brain. The outer part of the ear collects sound. That sound pressure is amplified through the middle portion of the ear and, in land animals, passed from the medium of air into a liquid medium. The change from air to liquid occurs because air surrounds the head and is contained in the ear canal and middle ear, but not in the inner ear. The inner ear is hollow, embedded in the temporal bone, the densest bone of the body. The hollow channels of the inner ear are filled with liquid, and contain a sensory epithelium that is studded with hair cells. The microscopic "hairs" of these cells are structural protein filaments that project out into the fluid. The hair cells are mechanoreceptors that release a chemical neurotransmitter when stimulated. Neurotransmitters are chemicals that are used to relay, amplify, and modulate electrical signals between a neuron and another cell. Sound waves moving through fluid push the filaments; if the filaments bend over enough it causes the hair cells to fire. In this way, sound waves are transformed into nerve impulses. In vision, the rods and cones of the retina play a similar role with light as the hair cells do with sound. The nerve impulses travel from the left and right ears through the eighth cranial nerve to both sides of the brain stem and up to the portion of the cerebral cortex dedicated to sound. This auditory part of the cerebral cortex is located in the temporal lobe. The part of the ear that is dedicated to sensing balance and position also sends impulses through the eighth cranial nerve, the VIIIth nerve's Vestibular Portion. Those impulses are sent to the vestibular portion of the central nervous system. Humans can generally hear sounds with frequencies between 20 Hertz(Hz) and 20 kiloHertz (kHz) (the audio range). Although the sensation of hearing requires an intact and functioning auditory portion of the central nervous system as well as a working ear, human deafness (extreme insensitivity to sound) most commonly occurs because of abnormalities of the inner ear, rather than the nerves or tracts of the central auditory system (Greinwald and Hartnick 2002). 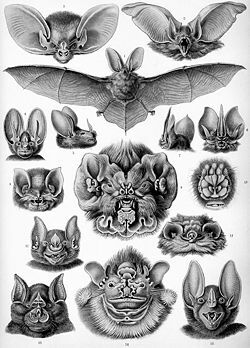 The shape of the outer ear of mammals varies widely across species. However, the inner workings of mammalian ears (including humans') are very similar. The outer ear is the most external portion of the ear. The outer ear includes the pinna (also called auricle), the ear canal, and the very most superficial layer of the ear drum, which is also called the "tympanic membrane." In humans, and almost all vertebrates, the only visible portion of the ear is the outer ear. Although the word "ear" may properly refer to the pinna (the flesh covered cartilage appendage on either side of the head), this portion of the ear is not vital for hearing. The complicated design of the human outer ear does help capture sound and imposes filtering that helps distinguish the direction of the sound source. But the most important functional aspect of the human outer ear is the ear canal itself. Unless the ear canal is open, hearing will be dampened. Ear wax (medical name: cerumen) is produced by glands in the skin of the outer portion of the ear canal. This outer ear canal skin is applied to cartilage; the thinner skin of the deep canal lies on the bone of the skull. Only the thicker cerumen-producing ear canal skin has hairs. The outer ear ends at the most superficial layer of the tympanic membrane. The tympanic membrane is commonly called the ear drum. The pinna helps direct sound through the ear canal to the tympanic membrane. In some animals, with mobile pinnae (like the horse), each pinna can be aimed independently to better receive the sound. For these animals, the pinnae help localize the direction of the sound source. Human beings localize sound within the central nervous system by comparing loudness from each ear in brain circuits that are connected to both ears. Ear piercing is a common practice in many cultures. Although the function of the human auricle (pinna) is rudimentary in terms of hearing, the ears do have an effect on facial appearance. In Western societies, protruding ears (present in about 5 percent of Europeans and their descendants) have been considered unattractive, particularly if asymmetric. The first surgery to reduce the projection of prominent ears was published in the medical literature in 1881. 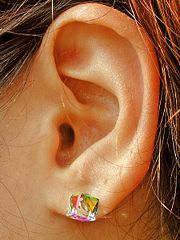 The ears have also been ornamented with jewelery for thousands of years, traditionally by piercing of the earlobe. In some cultures, ornaments are placed to stretch and enlarge the earlobes. Tearing of the earlobe from the weight of very heavy earrings, or traumatic pull of an earring, is fairly common. The repair of such a tear is usually not difficult. A cosmetic surgical procedure to reduce the size or change the shape of the ear is called an "otoplasty." In the rare cases when no pinna is formed, known as atresia, or is extremely small (microtia), reconstruction of the auricle is possible. Most often, a cartilage graft from another part of the body (generally, rib cartilage) is used to form the matrix of the ear, and skin grafts or rotation flaps are used to provide the covering skin. However, when babies are born without an auricle on one or both sides, or when the auricle is very tiny, the ear canal is ordinarily either small or absent, resulting in middle ear deformities. The initial medical intervention is aimed at assessing the baby's hearing and the condition of the ear canal, as well as the middle and inner ear. Depending on the results of tests, reconstruction of the outer ear is done in stages, with planning for any possible repairs of the rest of the ear (Lam 2004, Siegert 2003, Trigg and Applebaum 1998). The middle ear, an air-filled cavity behind the ear drum (tympanic membrane), includes the three ear bones, or ossicles: the malleus (or hammer), incus (or anvil), and the stapes (or stirrup). The opening of the Eustachian tube is also within the middle ear. The malleus has a long process (the manubrium, or handle) that is attached to the mobile portion of the eardrum. The incus is the bridge between the malleus and stapes. The stapes is the smallest named bone in the human body. The three bones are arranged so that movement of the tympanic membrane causes movement of the malleus, which causes movement of the incus, which causes movement of the stapes. When the stapes footplate pushes on the oval window, it causes movement of fluid within the cochlea, which is a portion of the inner ear. In humans and other land animals, the middle ear (like the ear canal) is normally filled with air. Unlike the open ear canal, however, the air of the middle ear is not in direct contact with the atmosphere outside the body. The Eustachian tube connects from the chamber of the middle ear to the back of the pharynx. The middle ear is very much like a specialized paranasal sinus, called the tympanic cavity; it, like the paranasal sinuses, is a hollow mucosa-lined cavity in the skull that is ventilated through the nose. The mastoid portion of the human temporal bone, which can be felt as a bump in the skull behind the pinna, also contains air, which is ventilated through the middle ear. Normally, the Eustachian tube is collapsed, but it gapes open both with swallowing and with positive pressure. When taking off in an airplane, the surrounding air pressure goes from higher (on the ground) to lower (in the sky). The air in the middle ear expands as the plane gains altitude, and pushes its way into the back of the nose and mouth. On the way down, the volume of air in the middle ear shrinks, and a slight vacuum is produced. Active opening of the Eustachian tube is required to equalize the pressure between the middle ear and the surrounding atmosphere as the plane descends. Divers also experience this change in pressure, but in the opposite direction; active opening of the Eustachian tube is required as divers go deeper in the water, into higher pressure. 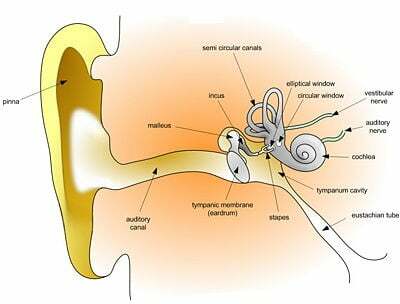 The arrangement of the tympanic membrane and ossicles works to efficiently couple the sound from the opening of the ear canal to the cochlea. There are several simple mechanisms that combine to increase the sound pressure. The first is the hydraulic principle. The surface area of the tympanic membrane is many times that of the stapes footplate. Sound energy strikes the tympanic membrane and is concentrated to the smaller footplate. A second mechanism is the "lever principle." The dimensions of the articulating ear ossicles lead to an increase in the force applied to the stapes footplate compared with that applied to the malleus. A third mechanism channels the sound pressure to one end of the cochlea and protects the other end from being struck by sound waves. In humans, this is called "round window protection." Abnormalities such as impacted ear wax (occlusion of the external ear canal), fixed or missing ossicles, or holes in the tympanic membrane generally produce conductive hearing loss. Conductive hearing loss may also result from middle ear inflammation causing fluid build-up in the normally air-filled space. Tympanoplasty is the general name of the operation to repair the middle ear's tympanic membrane and ossicles. Grafts from muscle fascia are ordinarily used to rebuild an intact ear drum. Sometimes artificial ear bones are placed to substitute for damaged ones, or a disrupted ossicular chain is rebuilt in order to conduct sound effectively. The inner ear includes both the organ of hearing, the cochlea, and a sense organ that is attuned to the effects of both gravity and motion, known as the vestibular apparatus. The balance portion of the inner ear consists of three semicircular canals and the vestibule. The inner ear is encased in the hardest bone of the body. Within this ivory hard bone, there are fluid-filled hollows. 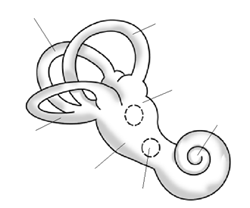 Within the cochlea are three fluid filled spaces: The tympanic canal, the vestibular canal, and the middle canal. The eighth cranial nerve comes from the brain stem to enter the inner ear. When sound strikes the ear drum, the movement is transferred to the footplate of the stapes, which presses into one of the fluid-filled ducts of the cochlea. The fluid inside this duct is moved, flowing against the receptor cells of the organ of Corti, which consequently fire. The organ of Corti is located in the cochlear duct and is made up of hair cell receptors and other support cells. When its cells fire, they stimulate the spiral ganglion, which send information through the auditory portion of the eighth cranial nerve to the brain. Although the initial processing of sound for pitch, loudness, and duration occurs in the cochlea, the brain must compute sensory input to localize sound. Hair cells are also the receptor cells involved in balance, although the hair cells of the auditory and vestibular systems of the ear are not identical. Vestibular hair cells are stimulated by movement of fluid in the semicircular canals and the two sac-like organs, the utricle and saccule. 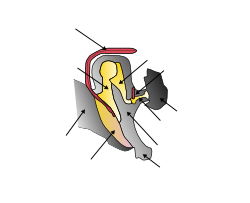 The semicircular canals, which connect to the utricle at their bases, have a sensory receptor at one end. They sense rotational acceleration. The receptors of the utricle and saccule (referred to as the otolith organs), which are different than the receptors of the semicircular canals, sense linear forces. In general, any firing of vestibular hair cells, whether from the semicircular canals or otolith organs, stimulates the vestibular portion of the eighth cranial nerve (Anson and Donaldson 1992). The auricle can be easily damaged. Because it is skin-covered cartilage, with only a thin padding of connective tissue, rough handling of the ear can cause enough swelling to jeopardize the blood supply to its framework, the auricular cartilage. That entire cartilage framework is fed by a thin covering membrane called the perichondrium, which literally means "around the cartilage." Any fluid from swelling, or blood from injury that collects between the perichondrium and the underlying cartilage, puts the cartilage in danger of being separated from its supply of nutrients. If portions of the cartilage starve and die, the ear never heals back into its normal shape. Instead, the cartilage becomes lumpy and distorted. "Wrestler's Ear" is one term used to describe the result, because wrestling is one of the most common ways such an injury occurs. "Cauliflower ear" is another name for the same condition, because the thickened auricle can resemble the cauliflower vegetable. The lobule of the ear (ear lobe) is the one part of the human auricle that normally contains no cartilage. Instead, it is a wedge of adipose tissue (fat) covered by skin. There are many normal variations to the shape of the ear lobe, which may be small or large. Tears of the earlobe can be generally repaired with good results. Since there is no cartilage, there is not the risk of deformity from a blood clot or pressure injury to the ear lobe. Other injuries to the outer ear occur fairly frequently, but rarely have such permanent consequences. Some of the more common ones include blast injuries from firecrackers and other explosives, and mechanical trauma from placement of foreign bodies into the ear. The ear canal most often is self-traumatized from efforts at ear cleaning. The outer part of the ear canal rests on the flesh of the head; the inner part rests in the opening of the bony skull called the external auditory meatus. The skin is very different on each part. The outer skin is thick, and contains glands as well as hair follicles. The glands make cerumen (ear wax). The skin of the outer part moves a bit if the pinna is pulled; it is only loosely applied to the underlying tissues. The skin of the bony canal, on the other hand, is not only among the most delicate skin in the human body, it is tightly applied to the underlying bone. A slender object used to blindly clean cerumen out of the ear often results instead with the wax being pushed in, and contact with the thin skin of the bony canal is likely to lead to laceration and bleeding. Like outer ear trauma, middle ear trauma most often comes from blast injuries and insertion of foreign objects into the ear. Skull fractures that go through the part of the skull containing the ear structures (the temporal bone) can also cause damage to the middle ear. Small perforations of the tympanic membrane usually heal on their own, but large perforations may require grafting. Displacement of the ossicles will cause a conductive hearing loss that can only be corrected with surgery. Forcible displacement of the stapes into the inner ear can cause a sensory neural hearing loss that cannot be corrected even if the ossicles are put back into proper position. Because human skin has a top waterproof layer of dead skin cells that are constantly shedding, displacement of portions of the tympanic membrane into the middle ear or deeper areas by trauma can be particularly traumatic. If the displaced skin lives within a closed area, the shed surface builds up over months and years and forms a cholesteatoma. The -oma ending of indicates a tumor in medical terminology, and although cholesteatoma is NOT a neoplasm (but a skin cyst), it can expand and erode the ear structures. The treatment for cholesteatoma is surgical. There are two principal damage mechanisms to the inner ear in industrialized society, and both injure hair cells. The first is exposure to elevated sound levels (noise trauma), and the second is exposure to drugs and other substances (ototoxicity). In 1972, the U.S. Environmental Protection Agency (EPA) told Congress that at least 34 million people were exposed to sound levels on a daily basis that are likely to lead to significant hearing loss (Senate Public Works Committee 1972). The worldwide implication for industrialized countries would place this exposed population in the hundreds of millions. The ear is designed to hear (perception of energy carried by sound waves). When the process of hearing is disturbed, hearing loss is said to have occurred. Hearing loss is a problem that is caused by a plethora of factors such as aging, disease, noise, and heredity. According to the National Institute on Deafness and Other Communication Disorders (2007), hearing loss is more prevalent in males and about 28 million Americans suffer from some sort of hearing impairment. When speaking specifically about hearing loss, varying levels and degrees of hearing loss are possible because of the complexity of the art of hearing. For example, hearing loss can be described as mild or severe and can affect different areas of the ear and/or brain. In general, hearing loss is classified and described as conductive, sensorineural, or central. The causes and treatments, if any, of these three forms of hearing loss vary from person to person depending on the severity and exact factors causing the problem. Conductive hearing loss occurs when sound cannot pass through the external or middle ear. It can be caused by excess ear wax clogging the ear canal, an infection causing fluid to be present in the canal, or trauma that negatively affects the vibration of the three middle ear bones (malleus, incus, and/or stapes). Conductive hearing loss can often be treated. For example, if the hearing loss is due to the bones of the middle ear, they may be able to be reconstructed using some of today's microsurgical techniques. The second form of hearing loss is sensorineural. It arises due to the structures present in the inner ear. The degeneration of hair cells, for instance, can cause semineuronal hearing loss. It is harder to treat than conductive hearing loss, but good results have been seen with the use of cochlear implants attached to tiny computers. This new generation of cochlear implants converts sound into electrical impulses, which are then converted into radio waves that activate electrodes surgically placed under the skin. The electrodes, which run straight into the cochlea, stimulate the sensory nerves when they are activated by the radio waves. This in turn allows for audition of loud noises. Ninety percent of hearing loss witnessed in the elderly population is sensorineural. The last form of hearing loss is central hearing loss. Although relatively uncommon, central hearing loss can be caused from damage to the neural pathways that run between the ear and the cerebral cortex (brain) or from damage to the cortex itself (Silverthorn 2004). Only vertebrate animals have ears, although many invertebrates are able to detect sound using other kinds of sense organs. In insects, tympanal organs are used to hear distant sounds. They are not confined to the head, but can occur in different locations depending on the group of insects (Yack and Fullard 1993). Simpler structures allow arthropods to detect near-at-hand sounds. Spiders and cockroaches, for example, have hairs on their legs which are used for detecting sound. Caterpillars may also have hairs on their body that perceive vibrations (Scoble 1992) and allow them to respond to sound. Greinwald, J., and C. Hartnick. 2002. The evaluation of children with sensorineural hearing loss. Archives of otolaryngology. Head and Neck Surgery 128(1): 84-87. Lam, S. M. 2004. Edward Talbot Ely: father of aesthetic otoplasty. Archives of Facial Plastic Surgery 6(1): 64. National Institute on Deafness and Other Communication Disorders (NIDCD). 2007. Statistics about hearing disorders, ear infections, and deafness. NIDCD. Retrieved April 4, 2007. Senate Public Works Committee. 1972. Noise Pollution and Abatement Act of 1972, S. Rep. No. 1160, 92nd Cong. 2nd session. Silverthorn, D. 2004. Human Physiology, An Integrated Approach, 3rd edition. San Francisco: Benjamin Cummings. Trigg, D. J., and E. L. Applebaum. 1998. Indications for the surgical repair of unilateral aural atresia in children. American Journal of Otology 19(5): 679-84. Yack, J. E., and J. H. Fullard. 1993. What is an insect ear? Ann. Entomol. Soc. Am. 86(6): 677-682. All links retrieved September 26, 2017. Details of various ear problems. This page was last modified on 26 September 2017, at 15:34.